Alex Salmond called the US president a "nincompoop". The former First Minister of Scotland has slammed Donald Trump for his comments on the prospect of a second independence referendum. Donald Trump waded into the constitutional debate over a second referendum on Scottish independence, claiming it would would be “terrible” for the country. In an apparent reference to the Brexit vote, the US President said Scotland “just went through hell” and that there was no appetite for a re-run of 2014’s referendum. Mr Trump made the comments during an interview with the Wall Street Journal last week, but they have only just been published after the full transcript was leaked online. In a bizarre exchange with the newspaper’s editor in chief Gerard Baker, the billionaire appeared to be most concerned about what would happen to the British Open if Scotland chose to leave the Union. Donald Trump’s opposition to independence should seal the deal for the SNP. “Is Scotland going to go for the vote, by the way? You don’t see it. It would be terrible. They just went through hell,” he said. Mr Trump’s late mother Mary Anne MacLeod was born and raised on Lewis and he has long taken an interest in Scotland’s affairs. The businessman owns two golf resorts at Turnberry in Ayrshire and Menie in Aberdeenshire and his organisation is in the process of investing £700 million in the facilities. He has also described the idea of holding another referendum as “crazy”, arguing that David Cameron should have placed a 50-year ban on a second vote when he signed the Edinburgh Agreement with former first minister Alex Salmond. Responding to Mr Trump’s comments, Mr Salmond described the president as “a complete and utter nincompoop”. “Donald Trump’s opposition to independence should seal the deal for the SNP – and to do it on the basis of Scotland losing the ‘British Open’ is typical,” he added. “The tournament is actually called The Open and the headquarters of the R&A is in St Andrews which last time I checked was in Scotland. 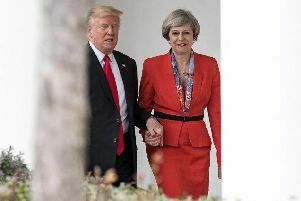 In the Wall Street Journal interview, Mr Trump also suggested that he wanted to do a trade deal with the UK after Brexit – partly to revive Britain’s standing in the world. “I can say that we’re going to be very involved with the UK. I mean, you don’t hear the word Britain any more. It’s very interesting. It’s like, nope,” he said. The President said he hoped to sign a deal “as soon as it’s appropriate” after the UK leaves the EU, which he accused of being a “protectionist” organisation.